Automatic Savings Plan – ask us how to pay yourself first automatically! Great games and prizes -- select a prize from our treasure chest when you make a deposit! Competitive rate of interest on required minimum balance of just $5! For more information, contact the Buckaroo Club Coordinator at your nearest State Bank location. 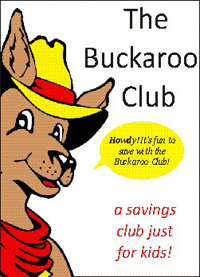 Click here to print your Buckaroo Club activity sheet! Use our savings and retirement calculators to help you reach your savings goal. We have the perfect checking account for you. Compare our checking options. Transferring money between checking and savings accounts is easy with Internet Banking.